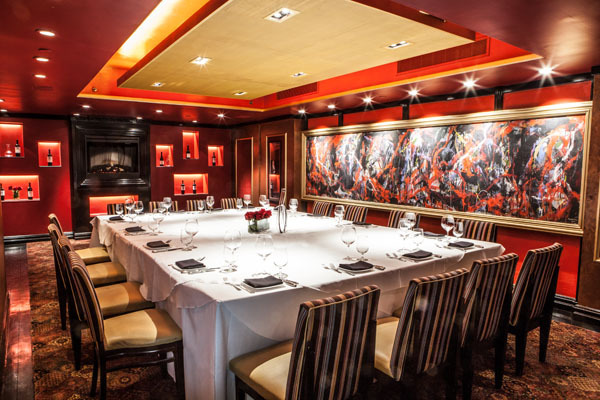 Experience a traditional steakhouse within walking distance of the famed Lincoln Center and Lincoln Square Movie Theater. This classic steakhouse was designed with a clear nostalgic décor reflective of the 1960s era. Diners will get a taste of steaks that are dry aged to perfection and cooked with the love and care that makes them succulent and juicy, or cooked the way you like. Guests can choose from a range of steaks including hanger steak, filet mignon, prime NY strip, prime dry aged double eagle strip bone in, prime dry aged rib eye, prime dry aged porterhouse and braised short rib. Opt in for the complimentary sauces to accompany your steak, which includes LSS steak sauce, hollandaise, béarnaise, green peppercorn, whole grain mustard and bordelaise. If steak isn’t on your mind, the lobster ravioli, pan seared wild king salmon; grilled Atlantic blue fin tuna or oven roasted Chilean sea bass is sure to satisfy your taste buds. The prefixe menu offered from 5pm to 6:30pm daily is a great option for group dining. Diners can choose from one of 5 appetizers including sizzling Canadian bacon, soup of the day, mixed green salad heart of lettuce and tomato or sliced tomato and onions. For entrée, choose from brook trout, Atlantic salmon, half chicken, hanger steak or the petite filet mignon and for dessert treat your sweet tooth to a chocolate cake, cheesecake or vanilla crème parfait. Patrons can request a private dining room, which includes the Lincoln room that accommodates up to 40 seated and 50 standing, the wine room, which accommodates up to 25 seated and 40 standing and also includes hand-crafted wine storage, the crimson room that offers an intimate 12 seating capacity and the blue room that accommodates up to 8 and includes television presentations and sports events. For the PDR, menus start at an affordable $65 for 3 courses even during the holidays, which is great for last minute holiday parties/events. Upon arrival guests are greeted with suave and class, as expected in the 60s era, with a touch of royal red opulence and crystal chandeliers. The multilevel pavilion outfitted from scratch by the architectural firm Diller Scofidio + Renfro provides guests three separate dining sections—one by the kitchen; one facing south, overlooking the theater spaces, and the other faces west. The wine tower is a spectacle to observe and the cream covered chairs add to the prosperity of the establishment. A pianist comes in at 7pm daily to provide live music and entertainment to diners while they indulge in delightful dishes. This holiday season, Lincoln Square Steak will be introducing family-style Italian classics to the menu such as Chicken Parm for Two served in a square grandma pan and Homemade Meatballs. For New Years Eve, Lincoln Square Steak will have a live 3-piece Jazz Band for entertainment and offer all guests a complimentary glass of champagne at midnight and guests can order off of the regular a la carte rather than an overpriced and limited pre fix menu.